Mikhail Vasilyevich Nesterov attributed himself to the artists of the Wanderers, but personal grief that happened to him at the very dawn of life, led him to modernity – the style of writing a picture with elements of fabulous images. The artist began to write the canvas when he was a student, he was then no more than 26 years old, two years before in 1886 his beautiful wife died, which Nesterov loved immensely, and therefore some pensive sadness is seen in his female portraits. The painting depicts a quiet forest glade surrounded by century-old trees. 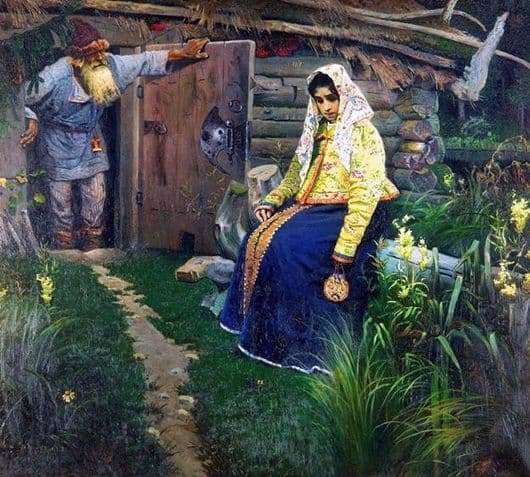 On the glade there is a wooden rickety house, from the open doors of which a gray-haired, hunched-over old man in a pointed cap, which in Russian fairy tales was customarily depicted exclusively on the sorcerer’s head, looks out. A lonely and very sad peasant girl sits on a log near a hut, immersed in greenery and flowers. Her handkerchief went astray and untied, her hands dropped to her knees, her whole image betrays deep spiritual experiences. Despite the fact that she came on business, the girl does not look at the owner of the house, turning her gaze, because she understands that the old man knows everything about her and the grief that eats her heart even without her story. In addition, the girl is scared, she came to ask for something to be silent, she came to the old man for a love potion to regain the love of her beloved. The artist does not show whether the sorcerer fulfilled her request, but it is reliably known that a lot of time and effort was devoted to writing this picture. In its first version, the girl did not come to the witch at all, but to the German doctor, but the same scene did not arouse the admiration of the creator and he invented the already well-known image of the canvas. For a long time, the picture was kept in private collections, after which it was donated to the Radishchev Museum.